YouTube the #1 social network site send some email notifications to user for the following reasons If someone subscribe your channel, if someone leaves comment on your video and more. 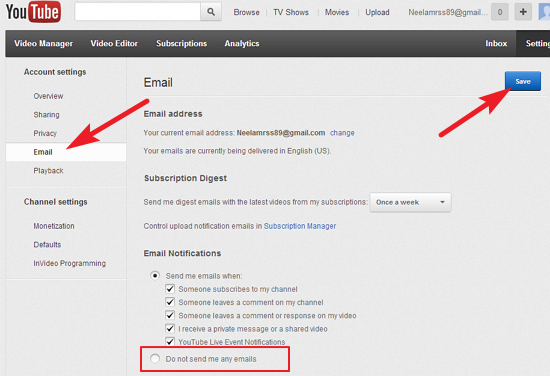 If you feel bore on these unwanted notifications, there is a option on YouTube users can stop email notifications. Then click on "YouTube settings"
Your Account settings page will open then select "Email"
In Email Notification section uncheck the check boxes for stop notification (or) if you want to stop all email notifications simply click on "Do not send me any emails" radio button. You are successfully disabled unwanted email notification from YouTube. Here after you won't receive these notifications to your mail.